The City of Sarasota has taken a significant step to improve communication access and give “front row seats” in council meetings and proceedings to those with hearing loss. Beginning September 30th, two locations in city government – the Sarasota City Hall Chambers and the Sarasota County Media Room, located in the City Hall Annex Building, – will be equipped with an induction loop system that enables people with hearing loss to hear council meetings and proceedings more clearly. Hearing aids and cochlear implants can work wonders to improve speech understanding. Still, there are some situations that may be problematic such as listening in groups, hearing in noisy or poor acoustical environments, or hearing a speaker who is more than a few feet away. In these situations, turning up the volume can result in turning up the background noise that you don’t want to hear. The hearing loop surrounds the area where the listening audience is located, and carries the sound signal through the loop with reduced ambient noise. The sound signal is picked up by telecoil-enabled hearing aids, cochlear implants, or headsets with loop receivers. The telecoil is activated simply by touching a switch on the individual’s personal hearing device, effectively customizing the sound for each user. Best of all, background noise and reverberation are eliminated, no extra devices are needed, and any number of users can take advantage of the system simultaneously. According to Johns Hopkins Medicine, 20% of our population, or approximately 145,000 residents in Sarasota/Manatee counties, has some level of hearing loss making it a public health issue third in line after heart disease and arthritis. Over the past 5 years, the Hearing Loss Association – Sarasota/Manatee Chapter has been successful in educating the community on the benefits of installing a hearing loop system in their business or venue. In addition to the Sarasota City Hall Chambers and the Media Room, more than 120 venues in Sarasota/Manatee counties offer hearing loop technology. The result is better communication access for persons with hearing loss benefit when attending area churches, the theater, or visiting business locations throughout our community. The new telecoil hearing loop has virtually no maintenance on the system and replaces the Commission’s FM system, which required the purchase/maintenance/repair of headphones for use. Visitors in need of hearing assistance or whose hearing devices are not telecoil-equipped may obtain complimentary lightweight headsets for hearing amplification at the City’s information desk. For more information on hearing loops and the Hearing Loss Association of America – Sarasota/Manatee Chapter, contact president@hlas.org or visit www.hlas.org. The Hearing Loss Association of America – Sarasota/Manatee Chapter and the Ear Research Foundation are two local non-profit organizations committed to raising awareness in our community about the impact of hearing loss on the individual, family & society. They share the common objective of furthering the education of persons of all ages with hearing loss on the latest devices, technology & services so they can continue to thrive, as well as reaching out to those who have yet to seek treatment & motivating them to obtain assistance. On Sunday, Aug 30, both organizations, in collaboration with McCurdy’s Comedy Theater, will host a night of comedy to introduce the 2015 Giving Challenge, their largest fundraiser of the year. Learn about hearing loss prevention, the positive impact each group is having on our community, and receive useful information about how to effectively manage hearing loss. For the first time McCurdy’s Comedy Theater will utilize both a hearing loop system and CART (Communication Access Realtime Translation or real-time captioning), so those affected by hearing loss can, once again, enjoy an evening of smiles and laughter! Just about everyone knows at least one joke or humorous story relating to hearing loss. Amusing, yes, but in reality, hearing loss is no laughing matter for either the afflicted, their family, friends, or those they interact with on a daily basis. Because we cannot see hearing loss, it is often referred to as an “invisible condition” affecting quality of life. Hearing connects us with the people and things we care about. As a central component of the communication process, the ability to hear properly is critical to maintaining relationships. Hearing makes it possible to engage, listen, laugh, love and enjoy many of the small things that help shape the quality of life. Untreated hearing loss often leads to feelings of anger and frustration, which can lead to isolation, depression and even dementia. The reality is hearing loss happens. According to Johns Hopkins Medicine, 20% of our population has some level of hearing loss. Locally, that translates into approximately 145,000 residents in Sarasota-Manatee counties. More alarming, 86% have yet to seek treatment. About the Ear Research Foundation – The Ear Research Foundation is a 501c3 non-profit community foundation dedicated to researching better treatments, educating physicians, and providing community education, treatment and outreach programs related to hearing loss and balance disorders. The Ear Research Foundation is a division of the Silverstein Institute and is located at 1901 Floyd Street, Sarasota, FL 34239. For more information please go to our web site www.EarRF.org. 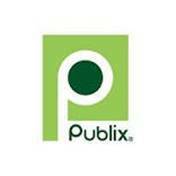 After two years of testing, last week Publix Supermarkets officially endorsed Hearing Loop solutions for any of their 1,098 stores who wish to add the system. By the end of March, the Long Boat Key and Venice stores will adopt this critical technology for those with hearing loss. Hearing loops is simple technology and easy to use. The system uses an electromagnetic signal to turn hearing devices, such as hearing aids with tele-coils and cochlear implants, into wireless receivers, requiring only a push of a button for clear, corrected sound delivered directly to the person with hearing loss. Publix tested hearing loops with great success in 4 locations inside their stores: pharmacy drop-off, pharmacy pick–up, Customer Service desk, and a checkout register. Installation of the system is at the discretion of the store manager. People with hearing loss can alert their local PUBLIX to the benefits of hearing loops and request they take advantage of the Loop Program instituted by Publix management. The Hearing Loss Association of America-Sarasota/Manatee Chapter appreciates Publix’s groundbreaking efforts to support the more than 145,000 people in Sarasota and Manatee counties with hearing loss, and looks forward to widespread adoption of this technology throughout our community. If you or a member of your family has been impacted by hearing loss, this event is not to be missed. The 4th Annual Hearing Tech Expo, hosted by the Hearing Loss Association of America Sarasota/Manatee Chapter, offers critical information on how to cope with and improve hearing loss. In addition to free hearing and health screenings, the Expo will feature over 40 exhibitors, including hearing aid and cochlear implant manufacturers, assistive listening device suppliers, providers of free captioned and amplified phones, and feature the latest state-of-the-art, new technologies. Six educational seminars, presented by experts in hearing loss and communications, will held throughout the day, every hour, beginning at 9:30am and with the last seminar at 1:30pm. Coping with tinnitus, how to hear better in noisy environments, and strategies for effective communication are several of the topics presented. 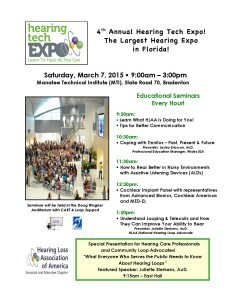 The Hearing Tech Expo takes place Saturday, March 7th, from 9:00am-3:00pm at the Manatee Technical Institute (MTI), 6305 State Road 70 in Bradenton, just 1 mile west of I-75 and exit 217B. Admission is free. For the first time in its history, the United States Supreme Court courtroom will be installing a hearing loop system this summer to enable people with hearing loss to follow the proceedings. Mr. Williams, who had sudden hearing loss and uses an implant plus hearing aid, has appeared before the court and knows first hand the difficulty of hearing in the courtroom. In 2013, Mr. Williams contacted the Supreme Court Marshal advocating that the court install a ‘hearing loop’ to enhance speech and voice recognition for people who are hearing impaired. Mr. Williams pointed to research showing that ‘hearing loops’ have become more prevalent in public facilities in the US and commonly found in most European public facilities. A hearing loop system consists of a microphone that picks up the spoken word and an amplifier that processes the signal. The signal is then sent to an induction loop, a wire placed around the perimeter of a room or sanctuary, which acts as an antenna that radiates the magnetic signal directly into to the hearing aid. Delivering personalized in-the-ear sound directly from a microphone into a hearing aid or cochlear implant reduces background noise and other acoustic distortions and increases the clarity and crispness of sound. Studies show that hearing loops offer better speech and music recognition than any other method. They are a better solution than traditional Assisted Listening Devices (ALD) because of their ease of use. They are also ADA compliant, cost effective to install and reduce the need for ALD devices and staff at venues. 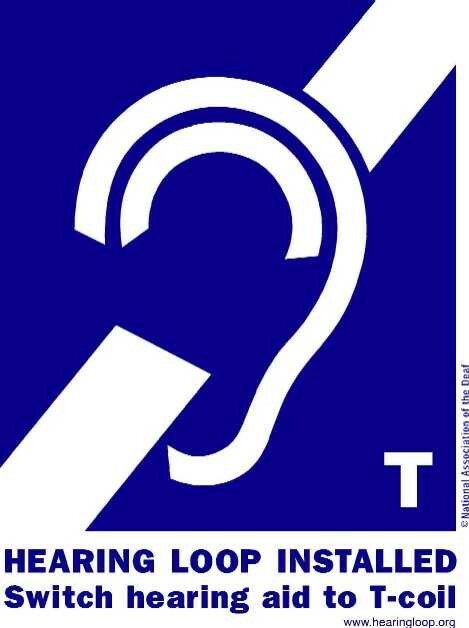 The Hearing Loss Association of America – Sarasota Chapter (HLAA-Sarasota) is a 501(c)(3) non-profit organization and the local chapter of the Hearing Loss Association of America, which is the nation’s foremost membership organization in promoting hearing loss advocacy, education/information and support. Its mission is to empower people with hearing loss to lead more active lives in the community.